In less than a month, the last of the watch auctions of the year will be taking place. Top auction houses like Christie’s, Sotheby’s, and Phillips will be hosting their luxury watch sales in Geneva to packed rooms for eager people looking to buy a Rolex. 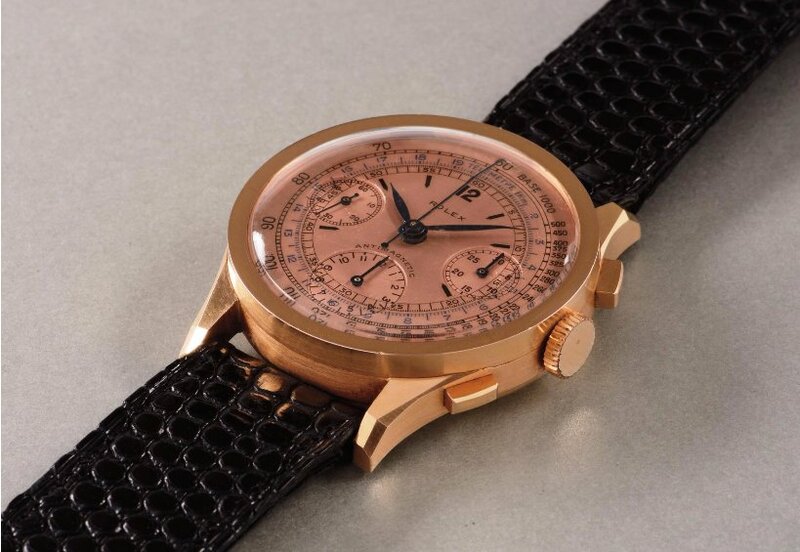 First up on the auction calendar is the Phillips’ event dubbed The Geneva Watch Auction: Four. Taking place over two days from November 12 – 13, 2016, the Phillips auction will set the tone for the fall auction season. Read on to see the five most expensive Rolex watches that will be up for grabs. First created in 1949, the ref. 4767 is part of a family of Rolexes referred to as the “Dato Compax” watches. They later picked up the nickname “Jean-Claude Killy” in reference to the champion skier and member of the Rolex Board of Directors who became associated with these timepieces. The ref. 4767 was the first Rolex triple calendar chronograph housed in a waterproof Oyster case, which was later followed by the ref. 5036, ref. 6036, and ref. 6236. This particular 4767 is crafted in 18k yellow gold and is in superb condition since its owner only ever wore it on the weekends. Now here’s a Rolex vintage sports model that has it all. 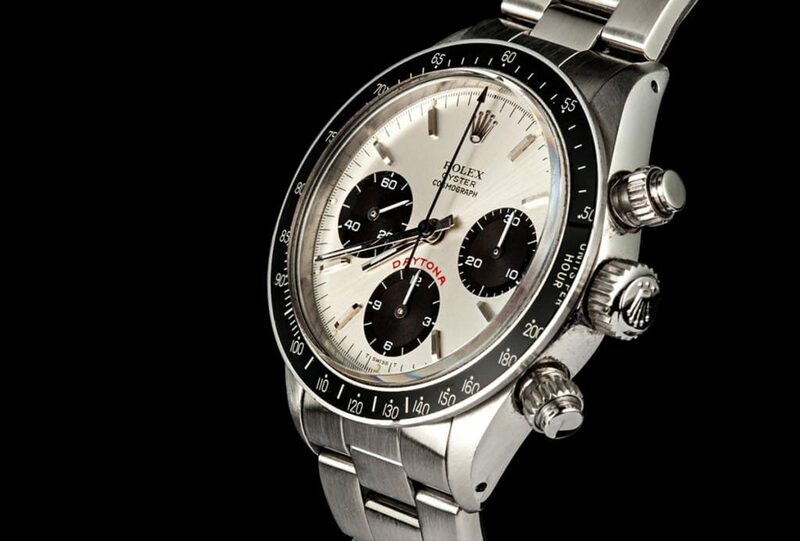 Firstly, it’s a Daytona Cosmograph ref. 6263 (with caseback stamped 6240). Secondly, it has the coveted Paul Newman panda dial. And finally, it was retailed by Tiffany & Co. and accordingly, stamped with the jeweler’s logo. 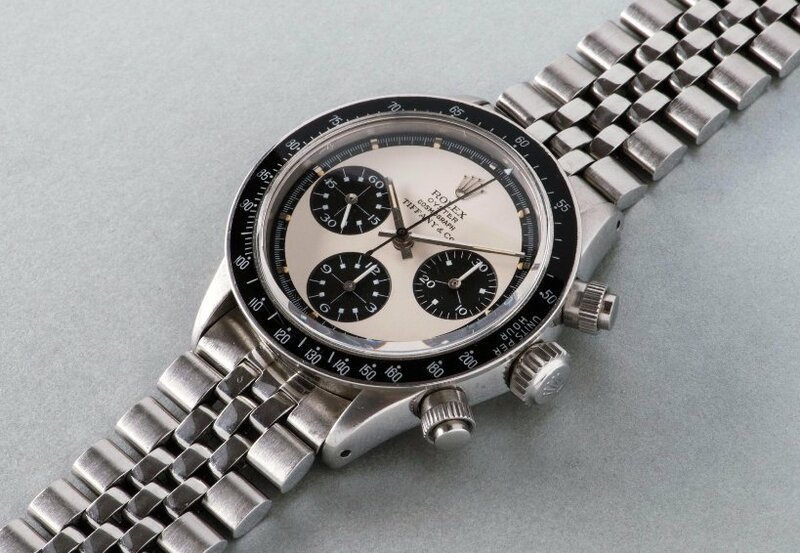 Circa 1970, this particular stainless steel Paul Newman Daytona is presented on a Jubilee bracelet rather than the Oyster bracelet more commonly found on Rolex Daytonas. 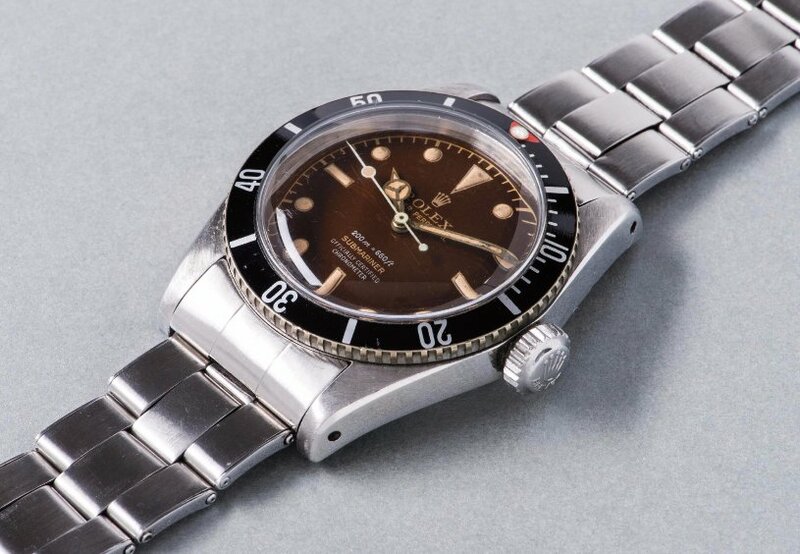 One of the rarest vintage Rolex ever made, the ref. 3330 pre-Oyster chronograph dates back to 1941 and the watch’s 37mm case was considered massive for its era. This particular example of the Rolex ref. 3300 is a pink gold version, perfectly harmonizing with its striking salmon dial. The dial itself is very technical looking with the three registers, in addition to the tachymeter and telemeter scales. This ref. 3300 is in exceptional condition despite its age. A Rolex Submariner that made its mark on popular culture while on the wrist of Sean Connery’s James Bond in Dr. No, the ref. 6835 is especially sought-after among the already very popular vintage Submariners. The dial of this specific ref. 6835 sports a tropical dial that has aged into a warm chocolate brown color. Moreover, the dial is a rare “four liner” with four lines of text rather than the two lines of writing more commonly found on the Submariner 6835. This model is also sometimes called the Submariner “Big Crown” due to its oversized winding crown. An exceptional example of the art of cloisonné, the 18k yellow gold ref. 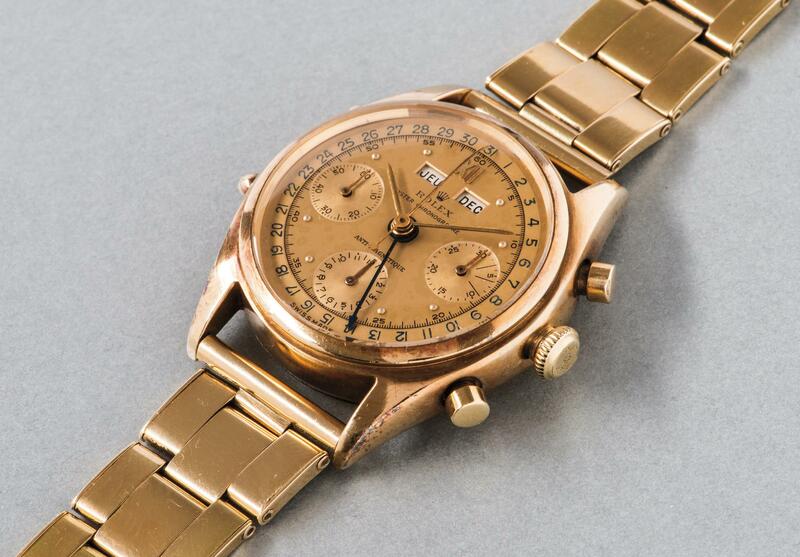 6085 is the most expensive Rolex of this Phillips auction. 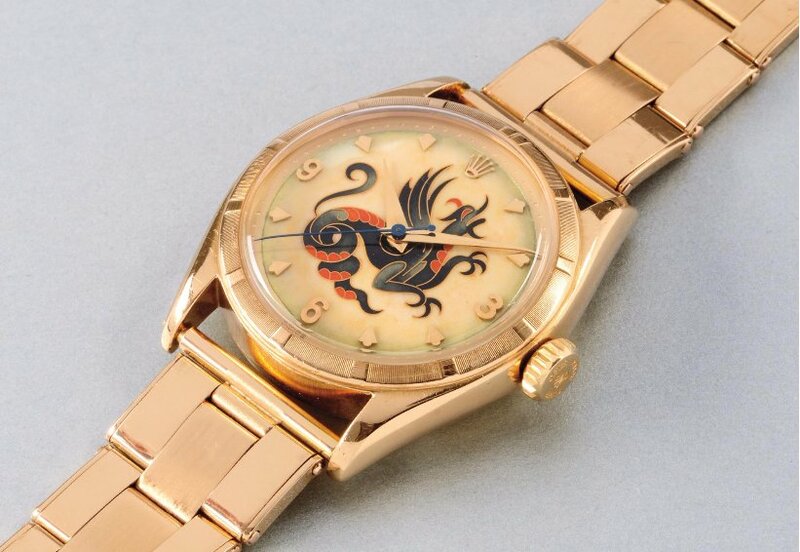 Made in 1952, the intricate dragon on the cloisonné enamel dial of this ref. 6085 was crafted by none other than the famous Stern Frères dial makers. It’s estimated that this is actually a unique piece since only four other Dragon dials were ever made but they were fitted on different reference numbers. Thus, this is the only recorded Rolex ref. 6085 equipped with the spectacular Dragon dial, thereby justifying its high estimate of over $1 million.